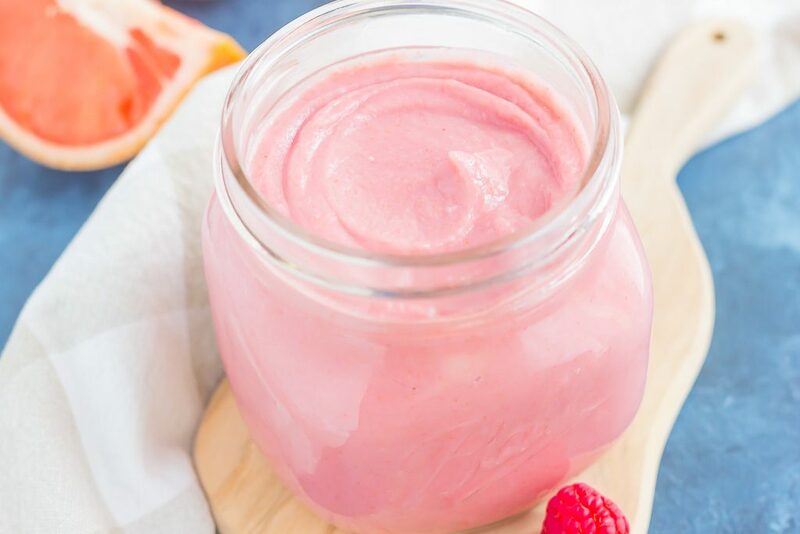 This Raspberry Grapefruit Curd is smooth, silky, and packed with lots of flavor! Fresh raspberries and tangy ruby red grapefruit create a luscious and creamy combination that is decadently delicious. This curd is perfect to serve with toast, pancakes, waffles, oatmeal, or even over ice cream! Can I make I confession? I don’t really like lemon curd. There. I said it. I can feel all of the glares now. I know a lot of you love lemon treats, but for me, it’s not a favorite of mine. 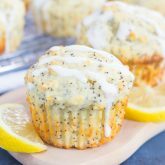 Sure, I love lemon poppy seed loaves, frozen strawberry lemonade, lemon muffins, and lemon cakes. I also love lemon in savory dishes (this asparagus or those green beans and that soup ). But lemon meringue pie, lemon curd, or anything with a lemon custard filling just doesn’t appeal to me. I think it’s because the lemon flavor is too strong, and I prefer it to just flavor the batter of a cake, cupcake, or loaf. So I guess it doesn’t come as a surprise that I skipped the ever-so popular lemon curd and made a Raspberry Grapefruit Curd instead. With no lemon in sight, the raspberries and grapefruit take over as the star of the show! This recipe is from the April issue of the Food Network Magazine. As soon as I saw it, I couldn’t wait to test it out! 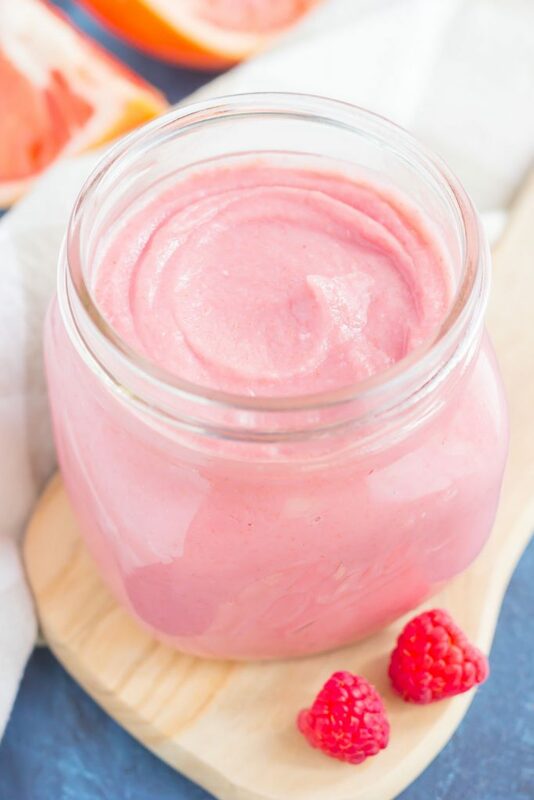 I’ve been toying with the idea of making some kind of curd for a long time, but when I saw the Raspberry Grapefruit Curd, I knew I couldn’t pass it up. And when I shared the process of making it on Insta-stories back in April, you all couldn’t wait to see the recipe, either! Well, it’s finally here, friends! And I’m officially hooked on this curd. Creamy, silky, smooth, and bursting with flavor. What more could you want? The sweetness from the raspberries and the tart flavor from the ruby red grapefruit make such a delicious combination. And the color! I’m in love with that pale pink gorgeousness. It really embodies summer, don’t ya think? Now, let me tell me all the ways you can enjoy this Raspberry Grapefruit Curd! 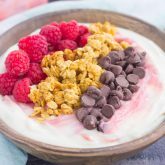 Spread it onto some toast, an English muffin or a bagel; drizzle it over waffles, pancakes, or french toast; add it to some oatmeal, yogurt, or even ice cream! And my personal favorite? Just dig in with a spoon, I won’t tell anyone! So go ahead, grab those ingredients and whip up this fresh and fruity curd today. 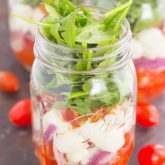 You’ll love the texture, taste, and the simplicity of this recipe! Looking for more fruit desserts? I’ve got you covered! 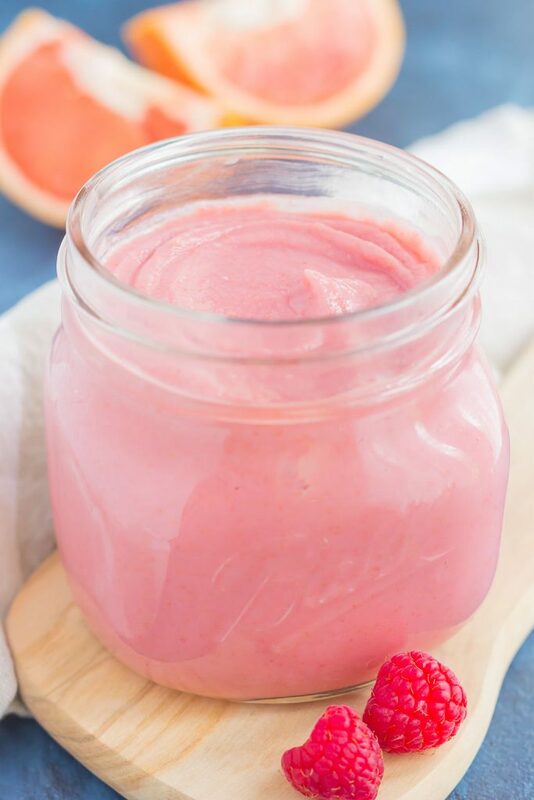 Puree the raspberries and grapefruit juice in a blender. Strain the mixture through a fine-mesh sieve into a medium saucepan, pusing in through with a rubber spatula. Rinse the sieve and set aside. 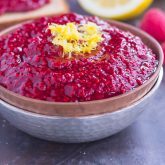 Whisk the sugar, cornstarch, grapefruit zest, and salt into the raspberry puree. Whisk in the egg yolks. Cook the mixture over medium heat, whisking constantly, until it's thick like pudding, about 5-7 minutes. Remove from heat and whisk in the butter a few pieces at a time until incorporated. Strain the mixture through the sieve into a small bowl, pushing it through with a rubber spatula. Press plastic wrap directly onto the surface to prevent a skin from forming. Refrigerate until completely set, at least for 4 hours, and up to 5 days. What? You don't like lemon curd???? I could eat that stuff straight up with a spoon (and have). I make it regularly and just a month or two ago I made grapefruit curd. I have to work on that one cause it wasn't quite enough 'grapefruity' flavour for my likin'. I want it nice and tart, ya know? This one looks absolutely gorgeous! Love the pretty pink colour and the pairing with raspberries. I would definitely spoon over fruit or pancakes, but probably eat straight up like I do with lemon curd, lol. Pinned, of course :) Have a wonderful weekend, my friend! Haha yep not a fan of too much lemon, wish I was! Thanks for the sweet comment, Dawn! I can't wait to try it! I usually have so many left over egg yolks from experimenting with french macarons. Love the flavor combination! Thanks, Annie! Happy weekend to you. I LOVE lemon curd...or any curd for that matter! I've never made one with grapefruit and love the sound of that, especially with raspberries! And this color is very easy on the eyes. :) I can't wait to see how you use this Gayle! Since you made a confession, I'm going to make one.. I don't really like grapefruit. My mother is a HUGE fan and use to force feed me it when I was younger. BUT, I do love me some (lemon) curd. AND raspberries. So I'm thinking I would probably LOVE this raspberry grapefruit curd. The color alone has me swooning, Gayle!! Such a pretty pale pink color!! Pinned! Cheers, friend! This is legit the prettiest curd I've ever seen in my life! I LOVE that there's grapefruit involved :) Pinned!! I love grapefruit and don't use it enough! Love that it's combined with raspberry in this curd! Thanks for the sweet comment, Jessica! This is such a beautiful curd and such a lovely color too! I have got to try it! Pinning. Corn starch made it too grainy. Prefer the traditional mouth feel of using all eggs. Nice experiment though. Sorry to hear you didn't like this, Caryn! I had no problems with it being grainy.